How do you get your family to love lentils? Add spaghetti and bacon of course. 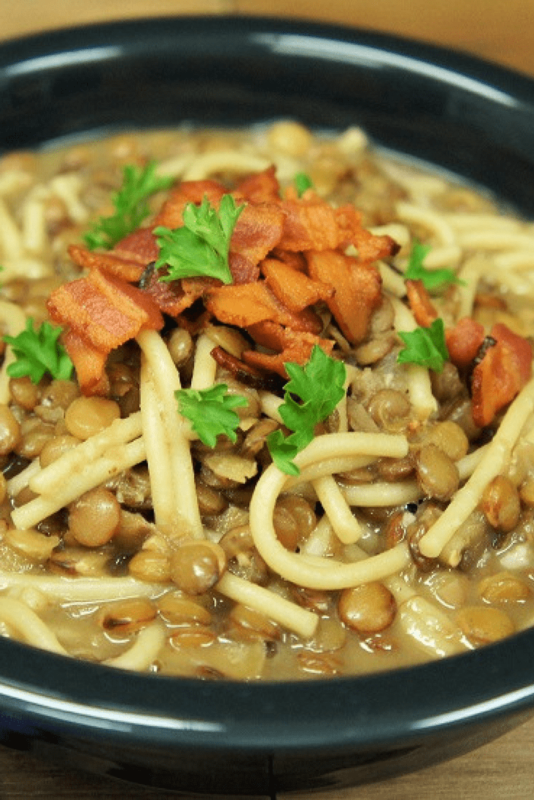 This Lentils with Spaghetti & Bacon recipe is really easy to make and absolutely delicious. We keep it simple with just a handful of ingredients: onions, garlic and oregano are sautéed in bacon drippings. Then we add the lentils, chicken broth and spaghetti, that’s it. Top the soup with the crispy bacon and serve with a side of crusty bread. Enjoy! Pick through the lentils and remove any foreign objects, such as tiny rocks. Don’t skip this step, I frequently find small rocks in the lentils, so pick through them thoroughly. Rinse the lentils well and drain, set aside. I like using kitchen shears to cut the bacon; it’s much easier and neater than chopping. Heat a large pot over medium heat. Add the chopped bacon. Cook the bacon until crispy, stirring frequently (about 6-8 minutes). Remove the pot from the heat. Using a slotted spoon, remove the bacon from the pot and place on a plate lined with a paper towel to drain. Set aside. Drain all but 2-3 tablespoons of the bacon drippings from the pot. Set the pot back over medium heat. Add the onions and cook for approximately 3 minutes until the onions start to soften, stirring frequently. Add the garlic and oregano, stir to combine well. Cook for 1 minute, stirring frequently. Add the lentils and the chicken broth to the pot, stir well. Raise the heat to high, bring the liquid to a boil, lower heat to medium-low and cover. Cook the lentils for 20-25 until almost al dente, stirring occasionally. Taste the lentils, they should be almost tender but with a little bit of bite in the middle. 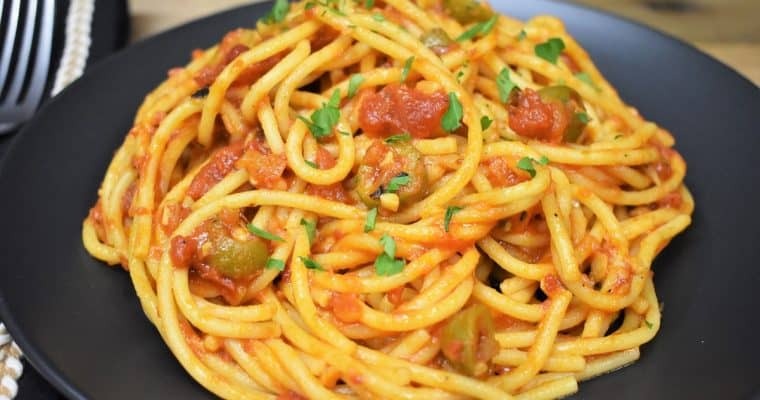 Add the spaghetti pieces to the pot, cover and cook until the pasta and the lentils are tender, approximately 15-20 minutes, depending on how you like your lentils. Stir occasionally. Taste the lentils; add salt (only if needed) and pepper to taste. 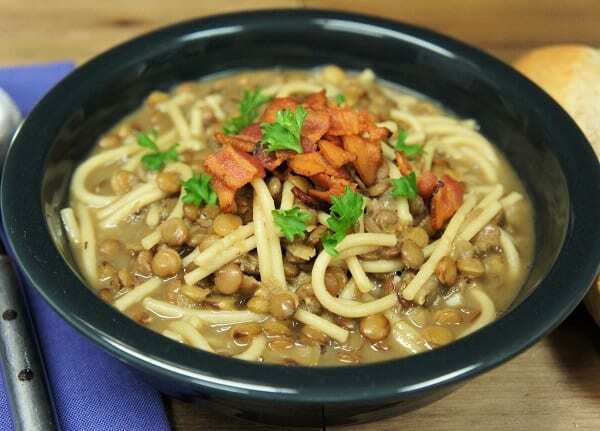 Serve the lentils with bacon & spaghetti in individual bowls and top with the reserved crispy bacon. 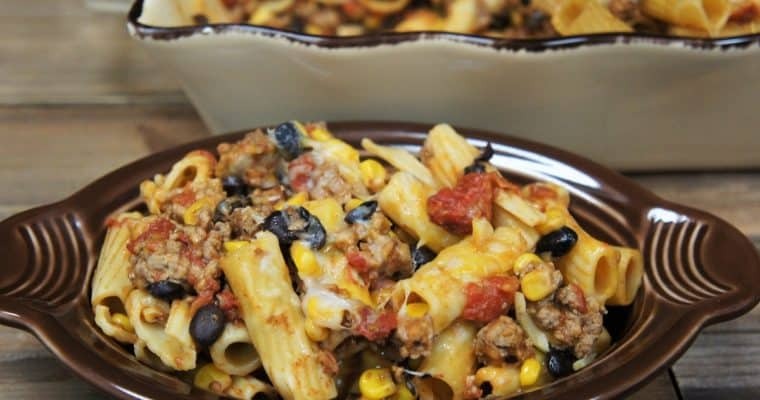 Serve with a side of warm crusty bread or crackers, if desired. Enjoy!